Life doesn’t always take the route you expected. Unanticipated opportunities and bumps in the road add twists to previously straight highways into the future. But amid changed plans is the possibility to thrive where you’ve been placed. 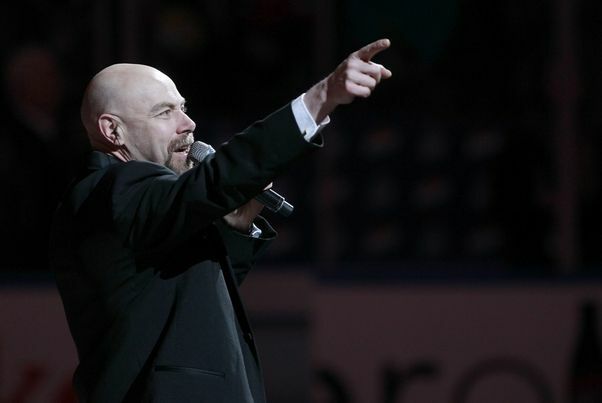 Doug Allen singing the National Anthem at a NHL Sabers hockey game. Just ask Doug Allen. At one time, he dreamed of success on the stage. Now, he follows two passions, singing the National Anthem for NHL Buffalo Sabers games at night and serving at the Buffalo City Mission during the day. He deeply enjoys and is passionate about both roles. To those in the stands, he’s a celebrity. He’s performed at their weddings and birthday parties and posed countless times for their cameras. (He’s even been featured as a cake topper for one fan’s son!) Few of these star-struck fans know of or could even imagine the completely different and humbling role he assumes when he’s not singing at the rink. During the day, Allen is the facilities coordinator at the City Mission. He melts ice, checks lights, and tackles things that need fixing. It’s not the glamour he looked forward to as a recent graduate with a degree in music education from Houghton College over 20 years ago. In fact, it started out as a job he worked while pursuing a master’s degree. But it’s been somewhere he’s been able to serve for over two decades. Why doesn’t Allen try to push for more success if he has the voice for it? The answer lies in the dedication he has to following God’s leading. If God has placed him as “the Anthem Guy” and a “maintenance man,” Allen is going to give these jobs his all. Allen hasn’t let disappointment from his earlier dream hold him back. Instead, with his humility, music-making abilities, and care for others, he’s forged a new kind of adventure.